MONTCLAIR, N.J. — A team of students from Montclair State University’s Feliciano Center for Entrepreneurship took home the top prize at the 3rd Annual TeleBrands Inventors Day for Aspiring Entrepreneurs Wednesday. The event is the culmination of two semesters the students’ dedicated to formulating a new product or service. 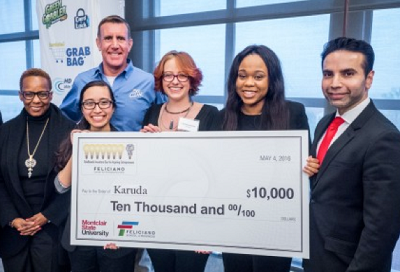 This year’s winning team created Karuda Skincare, a line of products based on the beneficial properties of coconut oil. Students Larissa Elvers, Christiana Himiob and Sacha Vincent received a check for $10,000 to help bring their idea to fruition in the marketplace. A total of 16 teams competed in the event, presenting their ideas to a panel of judges which included Manish Israni, Vice President of Market Research and New Product Acquisition, TeleBrands; Marjorie Perry, President and CEO of MZM Construction & Management Company, Inc.; and Andrew R. Gatto, Founder of Andrew R. Gatto Consulting. The Master of Ceremonies was international TV advertising pitchman, Anthony “Sully” Sullivan. The TeleBrands Inventors Day for Aspiring Entrepreneurs is modeled on the real-world Inventors Days TeleBrands has hosted around the country for years, in which basement inventors pitch consumer products in hopes of obtaining a marketing and manufacturing contract with the company. TeleBrands, widely considered the leader in the nation’s $350 billion “As Seen on TV” industry, is based in Fairfield, New Jersey. President and CEO AJ Khubani is an alumnus of Montclair State University.